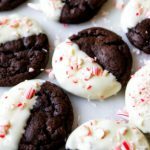 Keto Chocolate Peppermint Cookies are sugar free and gain free. It's low carb and keto diet friendly. Preheat the oven to 325F and line two baking sheets with silicone liners or parchment paper. In a large bowl, whisk together the almond flour, cocoa powder, sweetener, and salt. Stir in the butter and peppermint extract. Sprinkle the cream cheese over the surface. Use a pastry cutter or two sharp knives to cut the cream cheese in until the dough looks unified and comes together easily. Bake 15 minutes, switching the position of the trays in the oven halfway through the baking time to ensure even baking. Remove and let cool completely. Then place the cookies in the freezer for at least 1 hour (helps make the coating process easier). In a heatproof bowl set over a pan of barely simmering water, combine the chocolate and the cocoa butter. Stir until melted and smooth. Stir in the peppermint extract. One at a time, drop the cookies into the chocolate and flip over with a fork to coat both sides. Remove and set on a pan lined with waxed paper. Sprinkle with a few holiday sprinkles, or crushed peppermints, if using. Repeat with remaining cookies and place in the fridge for 20 minutes or so to set the chocolate. To drizzle cookies with a little white chocolate, break up the white chocolate into a microwave safe bowl and add the coconut oil. Heat on high in 30 second increments, stirring in between, until smooth. Place in a ziplock bag with the very corner snipped of and decorate as desired. Chill time is 1 hour and 20 minutes.